Labor • Late-arriving invoices show it spent $74K to quash effort. 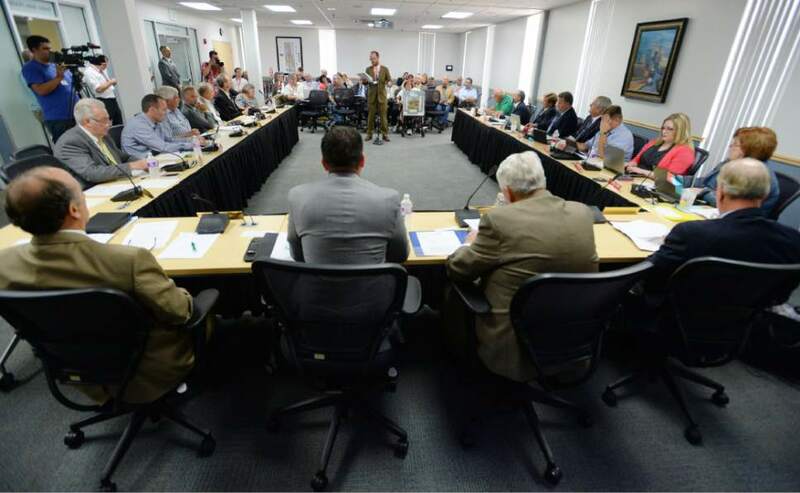 Steve Griffin | Tribune file photo The Utah Transit Authority in a meeting earlier this year. The Utah Transit Authority reported Wednesday that it spent 59 percent more on a "union busting" consultant than previously disclosed: $74,000 instead of $46,700. UTA paid that to the Labor Relations Institute (LRI) to help defeat efforts this year by the Teamsters Union to represent 44 TRAX supervisors. Those managers voted 25-19 to reject unionization in September. The $74,000 tab translates to UTA spending nearly $3,000 for each vote that eventually sided with the agency. "That&apos;s a lot of money," said Britt Miller, business agent of Teamsters Local 222, who wonders if disclosure of such spending before the election would have made a difference. Both the union and The Salt Lake Tribune sought the information before the vote through open-records requests. UTA initially refused to disclose the data. After a two-month tussle  and just before the State Records Committee was scheduled to hear the Tribune&apos;s appeal  UTA last month released documents listing $46,700 in expenses. That disclosure came amid UTA pledges that is trying to improve transparency to build public trust. On Wednesday, the agency told The Tribune it had found additional, late-arriving invoices from LRI that had not been available previously. "Although UTA has no ongoing obligation under GRAMA [Utah&apos;s Government Records Access and Management Act] to supplement a GRAMA request, UTA would like to provide the additional invoices to you," wrote UTA public records officer Michelle Larsen. "At least they get good marks for the extra disclosure," Miller said. UTA contracted to pay $3,000 a day for LRI consultants&apos; work while visiting Utah, plus travel expenses. Also, UTA agreed to pay consultants at a rate of $375 an hour if they phoned the consultants with questions. The company also provided videos, handouts, and posters for use in lobbying employees, and software to track efforts. LRI&apos;s website describes some videos, including one from a former labor organizer who "warns the average employee is very unlikely to learn the truth about unions until it is too late." Miller said the sorts of anti-union effort that his organization saw here with LRI "was pretty standard for what we see around the nation," and is surprised that UTA spent so much on it. He noted that UTA Board Chairman Robert McKinley is a labor lawyer himself, who generally represents management. "So it&apos;s not like they didn&apos;t have access to expertise locally." Last month when the first data was released, UTA spokesman Remi Barron said, "Because union elections are infrequent and governed by strict rules, UTA hired LRI to help it navigate the election appropriately."